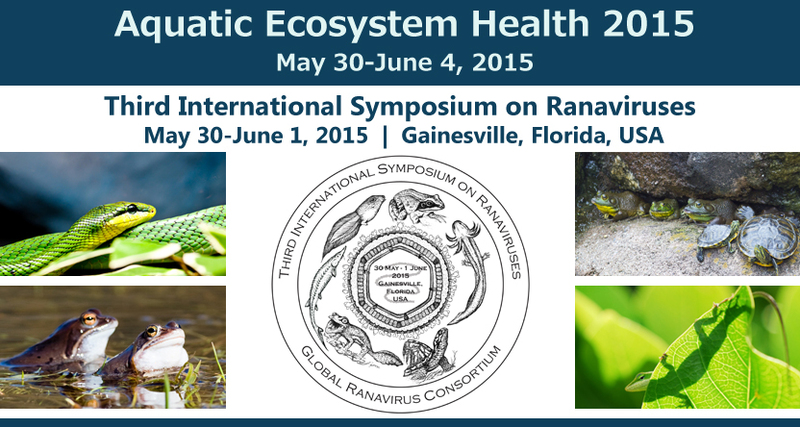 We invite you to join us for the Third International Symposium on Ranaviruses in 2015 as we join with the Fifth Florida Marine Mammal Conference for Aquatic Ecosystem Health 2015 to focus on the emergence, evolution, and effects of Ranaviruses in the context of broad aquatic ecosystem health concerns. The scientific community is increasingly aware that emerging infectious diseases pose a significant threat to global biodiversity. A group of viruses in the genus Ranavirus (Family Iridoviridae) cause disease in ectothermic vertebrates (e.g. amphibians, reptiles and fish) and appear to be emerging in many populations. Ranavirus-associated die-offs in larval and adult amphibians have been documented in the Americas, Europe, and Asia, with mortality often exceeding 90% during an outbreak. Ranavirus infections also have been reported in wild and cultured fish populations worldwide. While research on reptiles has been slower to accumulate, recent evidence suggests that ranaviruses are capable of causing morbidity and mortality in free-ranging populations. In an attempt to bring scientists together from across the globe to learn and share information about Ranaviruses, the Third International Symposium on Ranaviruses includes five thematic sessions over two-and-a-half days. Symposium sessions will begin with an overview presentation delivered by a topical expert on the session theme. These overview presentations will be followed by shorter research presentations on the relevant themes.